SKU: Cozumel Snuba Adveture. Categories: Cozumel Tours and Excursions. Cozumel Island is one of the most recognized places for professional divers and snorkelers from around the world. 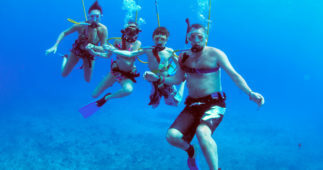 Now, SNUBA has also become one of the most popular Cozumel attractions. The professional and friendly guides will show you the tropical underwater world up-close without even having to surface for air. 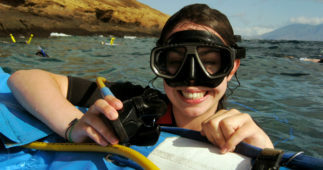 Now you can discover why the SNUBA system and guided touring program has become so popular with families and non-divers. After a 15 minute orientation, your SNUBA guide will accompany you on an underwater tour that is safe, easy and enjoyable at your own level of comfort. Your satisfaction is guaranteed. SNUBA was developed for the entire family. Anyone ages 8 and older can explore the sea to a maximum. The professional Dive Masters will be waiting for you close to the cruise ship piers. 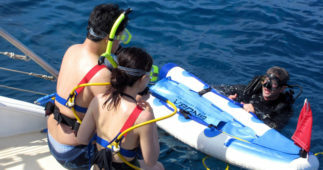 They will provide you with all the necessary equipment and safety instructions to participate in this Cozumel Activity. When everyone is ready to start, a group of 3 to 4 people per Dive Master will begin. Allow yourself to be awed by all the different types of tropical fishes and spectacular coral reefs, in a maximum depth of 20ft. After a thrilling 30 minutes dive, the instructors will bring you back to the shore. After your Cozumel Snuba tour, you are more than welcome to stay in the small beach club area that includes facilities like lounge chairs, beach tables and chairs, restrooms and showers, unlimited use of snorkel gear, or, if you prefer, just relax and enjoy the tasty snacks and drinks of a charming restaurant. If any members of your party are not participating in the SNUBA activity, everyone is welcome to eat at the restaurant and wait for you enjoying the beach in the facilities. Full use of all Beach Club facilities - stand up paddle boards SUP, lounge chairs, umbrellas, etc. Minimum Age to participate in the Snuba Activity is 6 years Old. Time underwater is approximately 25-30 minutes. Transportation is not included. We suggest a short taxi ride. Lockers are available for $2.00 usd.